I used to eat ready-made unsweetened muesli with milk for breakfast. That kind of muesli with all sorts of cereals, raisins and seeds. I have had this pack of muesli standing in my pantry for ages now, and I was looking for another way to use it (first and foremost to make more space in my pantry). Another question: Can muesli go off? Anyway, I found (yet another) recipe for cookies that I could tweak a little and that would use up my muesli nicely. The result is in fact very yummy, a nice and crunchy, not-so-sweet muesli cookie. 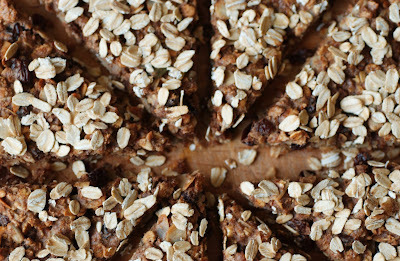 Perfect for breakfast or as a healthy snack in between and on the go. In fact, I will keep a few in my car as this is often the only place during the day where I sit and have some peace and quiet. Combine muesli, flour and cinnamon in one bowl. Separate the egg yolk and egg white. Stir together egg yolk, oil, honey and water and add to the dry ingredients. Whisk the egg whites until they become stiff and fold them gently into the dough. Lay out baking paper on a baking tray and spread the dough evenly. Keep it about 1cm thick. Sprinkle the oats over the dough. Bake at 200 degrees Celsius for about 20 minutes. Cut triangle shapes out of the dough as soon as you take it out of the oven. Let cool down and keep in dry airtight container. If your muesli does not contain raisins or other dried fruits, add a hand full as they provide some sweetness.